Subjectivity, our inability to see as others do, can be a cruel master. I’m gearing up to head to Honolulu, Hawaii to present at the Hawaii Library Conference 2009. 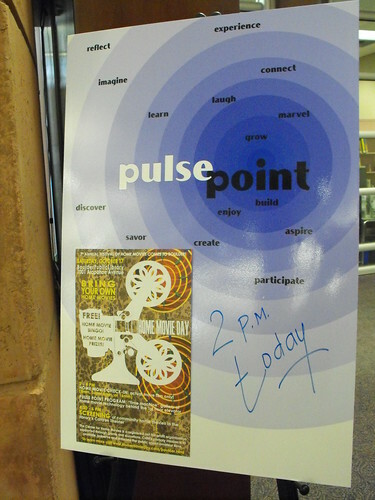 One of my sessions will be all about library experiences, particularly the slant that Boulder Public Library is taking on this broad and increasingly interesting arena through our Pulse Point initiative. Those that are attending the session on Pulse Points will get a lot of context for this image. What we know is that libraries and places of learning come alive when the people they are intended to to serve are engaged, intrigued or delighted in the process. By creating Pulse Points in your library or facility there is the opportunity to capture the imaginations and genius of both your customers and your staff. With the Pulse Point initiative, we are really undertaking a way of creating more interesting experiences while at the same time learning much about our capacity to explore curiosity, creativity and new ideas. Flexibility and discovery…all wrapped up in a great branded effort!